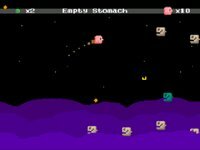 Starlit Zone Fighter is the latest effort by Lazrael, developer of Poyo among other notable projects. The attack system employed by this shmup is a little like the one used by Buster's Vacant Ark. Food has to be eaten constantly in order to accumulate shot power. 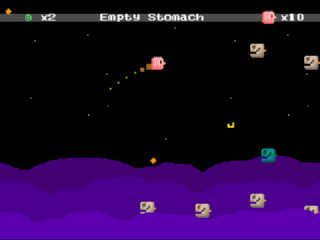 Press the C key to gather objects and tap the D key to spit them out. Mouse controls are supported, but it works best with a joypad connected.